We’d love your help. 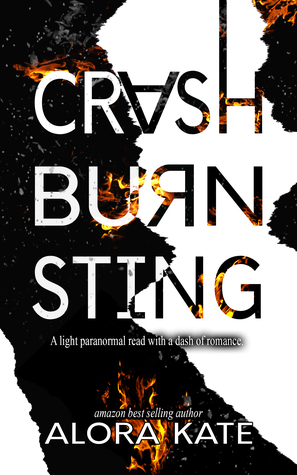 Let us know what’s wrong with this preview of Crash Burn Sting by Alora Kate. A light Paranormal read with a dash of romance. I don’t d A light Paranormal read with a dash of romance. To ask other readers questions about Crash Burn Sting, please sign up. When I started to read this book, I wasn’t honestly prepared for the remarkable journey Alora would take me on as she told the story of Rawson and Ysabelle.It’s one of those books that will give you a book hangover like you’ve never had. Rawson is a man who has lived a life of unmeasurable happiness at times, and the lowest point of tragedy you could ever face. All of this before he even lost his life. But then, somehow he’s brought back along with his guardian angel, Oath. In his mind, his death When I started to read this book, I wasn’t honestly prepared for the remarkable journey Alora would take me on as she told the story of Rawson and Ysabelle.It’s one of those books that will give you a book hangover like you’ve never had. Rawson is a man who has lived a life of unmeasurable happiness at times, and the lowest point of tragedy you could ever face. All of this before he even lost his life. But then, somehow he’s brought back along with his guardian angel, Oath. In his mind, his death was a valid one and he’s done enough wrong that he doesn’t deserve to go to a better place. Why can’t he just be shipped to Hell already? He doesn’t even know if he truly believes in Heaven after all that was taken away from him when he was alive. When he died he wasn’t even recognizable to himself. Now he has to rehash everything yet again and for what? What can he really gain from all of this? He thinks he knows where he belongs. Ysabelle is a young woman who has struggled through life, yet managed to be brought back from death a few times. She doesn't know what her purpose is in the world, only that she wants to give what she feels is right to others. Compassion, understanding, and even love. She believes in a higher power and knows that the reasons for her still being apart of this world is for a reason. Those reasons though are unknown to her. Or so she thinks. How can her life change yet again and will she get answers to all her questions? There are two moments in both characters lives where they have been put together unbeknownst to them. They have no clue that what happens from one particular moment and forward will not only change their roles in the world, but those around them. How scary is that? They meet once again and the journey that unfolds is a breathtaking roller coaster that has you asking a million questions. When I was done with this book, I was emotionally drained, my face hurt from all the tears, my chest ached and I had to use a hand towel for my nose because the tissues weren’t enough through my emotional ride. I swear I felt everything they felt, my heart ached for every rough moment, made my heart soar for every positive moment and made me laugh at the rather creative and clever characters that join this duo. Trust me when I say I’ve never read a book that tackles a spiritual theme quite like this. In the end, I was a hot mess but thankful for it. Because I found myself processing emotions I didn’t think I still had in regards to life and loss. With each book Alora shares with us you can see her dedication to her characters, their stories and her readers. She blows us away with the journey we share with them and leaves us wanting more. This is by far one of the best books I’ve ever read. I encourage you to pick this book up! Embrace it, keep an open mind and overall, find peace. Because what you may expect, could be shattered. Alora Kate is fast becoming one of my favorite indie authors. Crash.Burn.Sting is, at the very least, a gut wrenching read. At least by the time I read the last word that’s how I felt. The book offers so much to the reader. You have Rawson, a man who has suffered the worst losses a person can experience. The life he leads following those losses leads him to a less than idyllic life. Ultimately, one decision sends him into the ever after. He’s left in a battle between Heaven and Hell. More import Alora Kate is fast becoming one of my favorite indie authors. Crash.Burn.Sting is, at the very least, a gut wrenching read. At least by the time I read the last word that’s how I felt. The book offers so much to the reader. You have Rawson, a man who has suffered the worst losses a person can experience. The life he leads following those losses leads him to a less than idyllic life. Ultimately, one decision sends him into the ever after. He’s left in a battle between Heaven and Hell. More importantly he’s left in a battle with himself, his memories, and his emotions. Enter Ysabelle, a woman who has faced her fair share of challenges in her life but is a beautiful, caring soul. She’s been on the brink of death more than once and both of those situations left her tied to Rawson. She doesn’t know she’s tied to him because of her brushes with death. She does known that the mysterious stranger that lives in her building intrigues her and she tries to figure out why. Rawson and Ysabelle are drawn to one another, for reasons they don’t understand. They are both faced with dealing with their past all while trying to stay in the present. Oath, Melanie and Seth are the closets people to Rawson and Ysabelle respectively. All of them serve to help support and guide their friends through everything they go through. This book has everything. It is funny, thought-provoking, frustrating, happy, sad and unbelievable. Without giving detailed spoilers, because of certain factors in my life, upon reaching a certain point in the book, until I finished it, I felt as though I had stopped breathing because I had been emotionally gutted. Yes, this is definitely a book requiring a tissue or two. In my case it could have been a box! Despite my visceral reaction I cannot praise this book enough. This book was fantastically entertaining until I became so emotionally overwhelmed I wept. I cannot recommend this book to people enough; it is one of the most beautiful books I have read in my life. I never thought I would be giving 5 stars to a paranormal book. Never in a million years. However, Alora Kate's, Crash, Burn, Sting has totally changed my opinion on that. I went into this book after the author said it was light paranormal and not like most. I have read other books by this author and loved them. So after trying to decide if to take the plunge or not, I went for it. It has comedy, heartbreak, anger and love. I was really shocked by how much I loved this book. The connection betwe I never thought I would be giving 5 stars to a paranormal book. Never in a million years. However, Alora Kate's, Crash, Burn, Sting has totally changed my opinion on that. It has comedy, heartbreak, anger and love. I was really shocked by how much I loved this book. The connection between Rawson and Oath is one of brother and sisterly love. The fighting and arguing but unable to live without each other. Rawson wasn't always a bad guy. He loved and was a well liked member of the community. However, when he lost his soulmate, all that changed. Everything he had ever loved was gone. He is given a second chance to make it better, to make it complete. He just has to feel With Oath's guidance can he change his ways before he is banished to hell? When Oath becomes ill he needs help to make her better. This however comes in the form of Issa. The girl who he saved and the girl he died for. Issa couldn't help thinking about the man who saved her that day but also lost his own life in the process. Can helping Rawson also help her heal and thank him for his help? Maybe, but is the heartache it leaves in the journey enough. Will she be sting enough to survive? I'm really not sure how to describe this book without giving too much away, for me it was a totally unique concept with a fantatsic story. As the blurb states Rawson died he thinks everything is over but the fun is just beginning when he realises that God and The Devil are in competition to see who gets him. Rawson fascinated me as because of what he did he truly believes he's worthless the lowest of the low and deserves to go to Hell. He's given a second chance that he doesn't want and he's sent I'm really not sure how to describe this book without giving too much away, for me it was a totally unique concept with a fantatsic story. As the blurb states Rawson died he thinks everything is over but the fun is just beginning when he realises that God and The Devil are in competition to see who gets him. Rawson fascinated me as because of what he did he truly believes he's worthless the lowest of the low and deserves to go to Hell. He's given a second chance that he doesn't want and he's sent back to earth with Oath his guardian angel to carry out tasks but he doesn't really see what good it will do because nothing can change the outcome. I loved all the names and descriptions for the characters it gave the story a modern contemporary edge to it. The story flits between hope and despair, there is humor even if at times it's slightly dark humor ( which I loved ). The story gives us a tender balance between life and death, it's emotional and tender and everything in between and I loved every word. This isn't your average supernatural story. It's different. I'd bet money you've never read one like this before! I went into this book not knowing exactly what to expect. The plot was unique and not something I had read before and so I absolutely loved that but I felt there were holes here and there. Nothing that made the book bad by any means, I simply felt it was lacking something. I'm not a fan of obscene swearing either, so that was something that sort of left a bad taste in my mouth. I don' This isn't your average supernatural story. It's different. I'd bet money you've never read one like this before! I went into this book not knowing exactly what to expect. The plot was unique and not something I had read before and so I absolutely loved that but I felt there were holes here and there. Nothing that made the book bad by any means, I simply felt it was lacking something. I'm not a fan of obscene swearing either, so that was something that sort of left a bad taste in my mouth. I don't think that reflects poorly on the story at all, just my personal taste. I would read the story again and to me, that's the ultimate test; willingness to re-read a story. Nothing ended up the way I wanted it to, and this story made me cry. I don't cry. If I were a petty and irrational person, I would Hate this story. I am not those things. In fact, I absolutely loved this book! The story is the most unique story that I have ever read. I was hooked by the first page. I laughed, I cried, and I wanted to punch a certain character in the throat, at times. The story kept me interested the entire time. It's a SUPER sad and unfortunate story, with moments that have you Nothing ended up the way I wanted it to, and this story made me cry. I don't cry. If I were a petty and irrational person, I would Hate this story. I am not those things. In fact, I absolutely loved this book! The story is the most unique story that I have ever read. I was hooked by the first page. I laughed, I cried, and I wanted to punch a certain character in the throat, at times. The story kept me interested the entire time. It's a SUPER sad and unfortunate story, with moments that have you dying with laughter. The concepts are new and refreshing, and will really make you think. The characters a layered, and there is not shortage of angst. I'm not a super romantic person, so the fact that romance isn't constantly being thrown in your face, scored major points with me. This book deserves every star I gave it. I cannot think of a single person I wouldn't suggest this book too. Rawson believes he should go to hell instead of heaven. Instead he finds himself returning to earth with a mission he wants not part of and a guardian angel that won't stay out of his. head. Ysabelle is bound and determined to live her life to the fullest, after all she has cheated death twice. Ms. Kate writes a story that has characters that are full of life and will have you laughing and crying. She also writes a story that is full of intrigue, suspense, happiness and sadness that gut wrenchin Rawson believes he should go to hell instead of heaven. Instead he finds himself returning to earth with a mission he wants not part of and a guardian angel that won't stay out of his. head. Ysabelle is bound and determined to live her life to the fullest, after all she has cheated death twice. Ms. Kate writes a story that has characters that are full of life and will have you laughing and crying. She also writes a story that is full of intrigue, suspense, happiness and sadness that gut wrenching. Her stories will leave a mark. Alora Kate has done it again! She said, I think want to write a paranormal book, and wow!! Did she deliver!! This story is unlike anything I've ever read before. It is different and new. But Alora pulls your heartstrings so tight, then releases them so slowly to let you experience all the feels. 5+stars! Fantastic book! I couldn't put it down. This is not Alora's usual genre, but she proved she can write anything! Crash Burn Sting follows Rawson as the powers that be (God and the Devil) decide what is to become of his soul. Rawson clearly thinks he's not worthy for anything but Hell, but God decides to send him back to Earth for a special job before it is decided what will happen to his soul. This is Alora Kate's first paranormal novel and I think she did an amazing job. It's not overly paranormal so if your not a huge fan of that kind of book this would be brilliant for you. There is a lot going off in t Crash Burn Sting follows Rawson as the powers that be (God and the Devil) decide what is to become of his soul. Rawson clearly thinks he's not worthy for anything but Hell, but God decides to send him back to Earth for a special job before it is decided what will happen to his soul. Something that I appreciate about Alora Kate is how she writes in such different genres. Just whatever comes to her gets put down on paper! I just love it! This book was definitely not what I was expecting at all! One of the things that I enjoy as a reader is getting to see everything fall into pieces while the characters are still trying to figure it out while I am over here yelling at them and contemplating throwing my kindle on the ground. I like the feeling of getting a sneak peak and Alora d Something that I appreciate about Alora Kate is how she writes in such different genres. Just whatever comes to her gets put down on paper! I just love it! This book was definitely not what I was expecting at all! One of the things that I enjoy as a reader is getting to see everything fall into pieces while the characters are still trying to figure it out while I am over here yelling at them and contemplating throwing my kindle on the ground. I like the feeling of getting a sneak peak and Alora did that in this book. We get to see the story through the eyes of Issa and Rawson and see as they struggle to make sense of life. This ending is not at all what I was expecting and it made me so angry/happy so I didn’t really know what to do! Of course, it all worked out and everything was just how it was supposed to be but it was so bittersweet! Alora definitely made a rollercoaster of emotions happen. "This was a totally different book from what I normally read, but I really liked it. When Rawson dies the devil and God are fighting over his soul, but God decides that he needs to go back to earth as Cupid. Then they will decide where he goes. Wow, I LOVE this book by Alora Kate. Crash Burn Sting is a unique story that had me hooked from the beginning. I don’t usually read Paranormal but I’m so glad I gave this one a try. It’s light on the paranormal but heavy on the feels. It’s an emotional journey that not only had me in tears, but also made me smile and chuckle at times. I love that she gave me information slowly, allowing me to make my own predictions. I sensed something more…..deeper and when it all came together, oh, my heart. Ra Wow, I LOVE this book by Alora Kate. Crash Burn Sting is a unique story that had me hooked from the beginning. I don’t usually read Paranormal but I’m so glad I gave this one a try. It’s light on the paranormal but heavy on the feels. It’s an emotional journey that not only had me in tears, but also made me smile and chuckle at times. I love that she gave me information slowly, allowing me to make my own predictions. I sensed something more…..deeper and when it all came together, oh, my heart. Rawson, this guy has had so much heartbreak in his life. I couldn’t help but cry for him…with him. He got himself on a bad path due to his pain, has trouble seeing the good. I’m so thankful for the chance he was given and for Oath and Ysabelle helping him see and believe not just in himself but more. The chemistry between the characters, friendships are all great. They truly care for one another; you can feel it. I love everything I’ve read by Alora Kate some more than others. This one is in my top two. I highly recommend it even if you aren’t a paranormal fan, it’s so much more than that……true love….soul mates……and beyond! 5 "Until the end of time" stars!!! WOW am I glad I found this author! I also love that KFA doesn't fall into the normal realm of bloggers because she helps authors that aren't well-known in the community of FB and I've found some exceptional authors this way! In Crash Burn Sting the main character Rawson has found himself in purgatory. He wants to go to hell but his guardian angel, Oath, is convinced that he has more work to do on earth before he is sent to either Heaven or Hell. The book is li 5 "Until the end of time" stars!!! In Crash Burn Sting the main character Rawson has found himself in purgatory. He wants to go to hell but his guardian angel, Oath, is convinced that he has more work to do on earth before he is sent to either Heaven or Hell. The book is listed as paranormal because he is technically dead, but other than that there are no vampires, wolves, time travelers, etc. He has had a tragic past and present and he has to right some wrongs. Ysabelle has been saved from a tragic accident that took a man's life instead of her own. She has spent time trying to track his family down to thank them but to no avail. She later finds Rowan after an incident at her work place. She finds more in him than she ever imagined. This story is very emotional and definitely one to read! Don't worry you will have a smile on your face by the end and will be happy to find a happily ever after! I went into this book blind, knowing absolutely nothing about it apart from the title. I have read a few books by Alora already and loved them. This was different. I have never been one for paranormal books, the ones i have read in the past i have never truly enjoyed, so tend to stay clear. If i had known that this had a paranormal twist to it - i probably would not have read it. I am so so SO glad i didnt know! I'm so glad i read this I voluntarily reviewed an advanced reader copy of this book. I have never been one for paranormal books, the ones i have read in the past i have never truly enjoyed, so tend to stay clear. If i had known that this had a paranormal twist to it - i probably would not have read it. I am so so SO glad i didnt know! I'm so glad i read this story as i absolutely loved it! It was very different from any book i have read. I was totally gripped from the first page. The emotions, the love, were so powerful you could feel it. I cried so many times - i hurt along with the characters, i felt what they felt. It made me laugh, made me angry and it made me very happy. This is Alora Kate's first paranormal book and just goes to show that she can write any genre and it will be amazing! Crash burn sting is a unique story and it really had me hooked. With Good and Evil fighting over his soul, Rawson is given a second chance and is sent back to Earth with his Guardian Angel, Oath. But he neither wants, or thinks he deserves, to be anywhere but spending an eternity in hell. I love the characters, and with the emotion and rawness that Alora Kate commits too, she mad This is Alora Kate's first paranormal book and just goes to show that she can write any genre and it will be amazing! Crash burn sting is a unique story and it really had me hooked. With Good and Evil fighting over his soul, Rawson is given a second chance and is sent back to Earth with his Guardian Angel, Oath. But he neither wants, or thinks he deserves, to be anywhere but spending an eternity in hell. I love the characters, and with the emotion and rawness that Alora Kate commits too, she made me feel every bit of pain and loss Rawson felt. I was worried how this was going to come together and work out, but Alora Kate pulled it off with style, this is going to be a hard book to follow. Crash Burn Sting is guaranteed to have you feeling every emotion possible. Add in romance and a unique, well written story, what more could I ask for? Overall, a great read. Alora Kate is exactly why I love reading paranormal stories so much. Crash, Burn, Sting delivers on a unique storyline between the battle of heaven and hell and love and loss. Alora has created such an awesome story that takes you on a spiritual ride between two main characters that are connected by death yet their attraction to one another is heart wrenching and emotional. I loved everything about this book. You definitely are taken on a roller coaster ride of emotions from laughing your head o Alora Kate is exactly why I love reading paranormal stories so much. Crash, Burn, Sting delivers on a unique storyline between the battle of heaven and hell and love and loss. I loved everything about this book. You definitely are taken on a roller coaster ride of emotions from laughing your head off to crying your eyes out. So make sure you have a box of tissues on the side. It does drain your batteries but so worth every page. I highly recommend this book to anyone. You don't have to be a lover of paranormal, you just have to love stories that fill your heart with gut wrenching emotions yet leaves you wanting more and more. Let me tell you, Alora Kate is killing it this year. Her newest release, Crash, Burn, Sting is one of my top reads of the year making both of her releases of the year topping that list for me! I was introduced to Alora Kate by an ad were she was changing book covers and I bought the original books because I'm a sap for original covers. I. Regret. Nothing. 2017 has definitely been her year in releasing amazing books. Crash, Burn, Sting is a paranormal romance, but it is not your usual paranormal. Let me tell you, Alora Kate is killing it this year. Her newest release, Crash, Burn, Sting is one of my top reads of the year making both of her releases of the year topping that list for me! I was introduced to Alora Kate by an ad were she was changing book covers and I bought the original books because I'm a sap for original covers. I. Regret. Nothing. 2017 has definitely been her year in releasing amazing books. Crash, Burn, Sting is a paranormal romance, but it is not your usual paranormal. There's non vampires, wolves, mysterious creatures etc. There is so much more to this story and it is one I recommend just picking up and reading without researching because you want all of the surprises, trust me. Fantastic read! There is a struggle between God and Satan for Rawsons soul... They both feel they have the rights to it...so to speak... Rawson is given a chance to go one way or the other by doing certain deeds back on earth. Rawson feels he does not deserve to go to heaven, but his guardian angel, Oath, feels he is worth the redemption. This is an interesting story of an inner struggle, good vs bad... and every one having just a little bit of good in them no matter what they have done in life. Alora Kate has s There is a struggle between God and Satan for Rawsons soul... They both feel they have the rights to it...so to speak... Rawson is given a chance to go one way or the other by doing certain deeds back on earth. Rawson feels he does not deserve to go to heaven, but his guardian angel, Oath, feels he is worth the redemption. This is an interesting story of an inner struggle, good vs bad... and every one having just a little bit of good in them no matter what they have done in life. Alora Kate has spun her own tale of good vs evil with a modern twist, one I think many will enjoy reading. I highly recommend this book! This isn't what I would classify as romance since it doesn't have the typical steam. Yet, I would call it romance because it a story about love and soulmates. It is going from the highest of highs to the lowest of lows. I loved the twist on Johnny and Cash and who they were supposed to be. I felt the connection between Rawson and Oath. It made me smile when she hot in his head. Then there was Issa. My heart hurt for her knowing she could never have what her soul wanted. It was a relief to know that Cupid had other plans. "We all crash and that it'll burn or sting, but we have to get back up, brush ourselves off, and keep going." What an amazingly well written story. It was raw and gritty and sweet. Rawson, reincarnated as cupid has to help people to fall in love to determine his future. The problem, he doesn't believe in love anymore. With the help of Oath and Ysabelle, Rawson will be forced to face his inner demons to have his HEA. This is a very different love story that had so many feels. This was a totally different book from what I read, but I really liked it. When Rawson dies the devil and God are fighting over his soul, but God decides that he needs to go back to earth as Cupid. Then they will decide where he goes. This was a fun read about soulmates and I really think you will enjoy it! I have again fallen for a book by this author. I continue to be amazed by the depth of her characters & worlds. While I do not consider myself a religious person, I am spiritual and thoroughly enjoyed this story. You will see love and faith in a new light as you struggle through the battles of the characters. Maybe true love really does exist after all.